So, The Expanse is a massively popular adult Science Fiction series (which has now been turned into a TV show on Syfy) that I’ve been seeing everywhere. I’ve never read much adult sci-fi, but that is one of my goals for 2017. I was hoping that this would be a series I could fall in love with. It was, and I did. 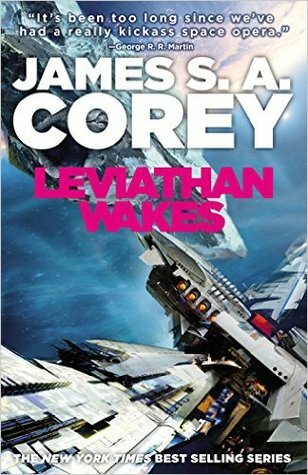 Leviathan Wakes takes place a few hundred years in the future when humanity has colonized the solar system including the Moon, Mars, and the Asteroid Belt. This book is told in dual-POV and alternates chapters between the two perspectives. Jim Holden is the XO of a mining vessel which transports ice from the rings of Saturn to stations in the Belt. But, when they hear a distress call from a ship called the Scopuli, things go south – fast. Jim & his crew come into possession of a secret worth killing for that has the ability to launch the entire system into war. Detective Miller is assigned a case by his captain on Ceres Station – find a missing girl and ship her home. When the trail leads him to the Scopuli and the Outer Planets Alliance (OPA) a group of rebel Belters fighting for independence from Mars, Holden discovers that the girl may be the key to the mystery. The world of Leviathan Wakes is messy. There is a lot animosity between the inner planets and the outer planets. In the Belt, water and air are worth killing for. And, as Miller regularly reminds people, Ceres has cops – not laws. Belters resent Earthers for talking their resources and being able to breathe air freely. Earthers have a hard time thinking of Belters as humans. And, Mars wants to be the superpower, not Earth. One of the most interesting things about this story is that for the first half of the book, its like a two-in-one deal: one half epic space opera and one half noir detective novel. The story jumps back and forth between perspectives – and I was always bummed to leave one story line, but so excited to get more information about the other. The characters are fantastic – and Holden and Miller are a great contrast with each other. Holden is idealistic – almost to the point of naivety. While Miller is cynical and prefers his morality with more gray. But, I find them both equally compelling – and it works for their story lines. Holden’s crew needs someone to look to, and Miller needs that gritty world view to help him navigate his case. This is not a series for the faint of heart – there are at least 9 planned novels and as many short stories/novellas. I highly recommend checking out the recommending reading list on Goodreads here. I was blown away by this story, and I can’t wait to pick on Caliban’s War to see where the story goes next.